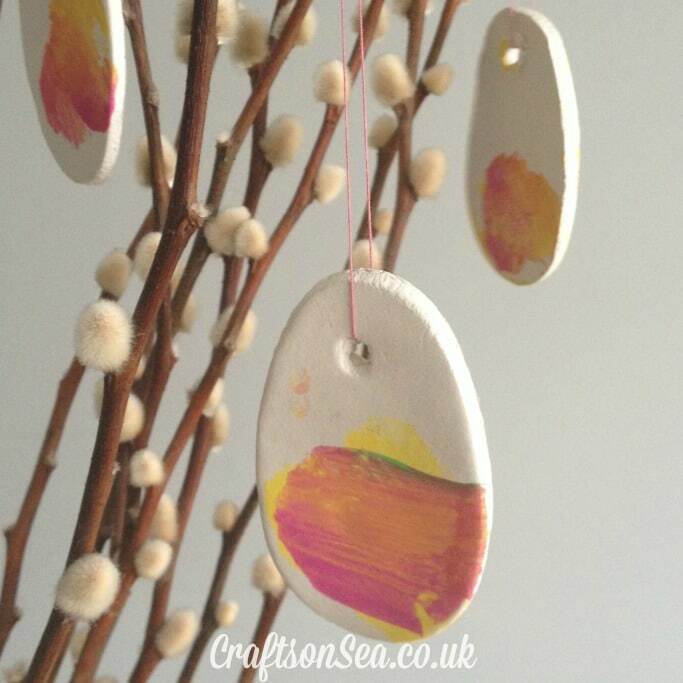 Yesterday I shared a cute round up of Easter Egg Crafts for Preschoolers for this weeks Tuesday Tutorials and today we’re joining in with these sweet Easter tree decorations that the kids decorated! These were so simple to do and my kids both had loads of fun doing them, and of course we now have some cute Easter tree ornaments to put up too! I cut out all the Easter egg shapes a day in advance. 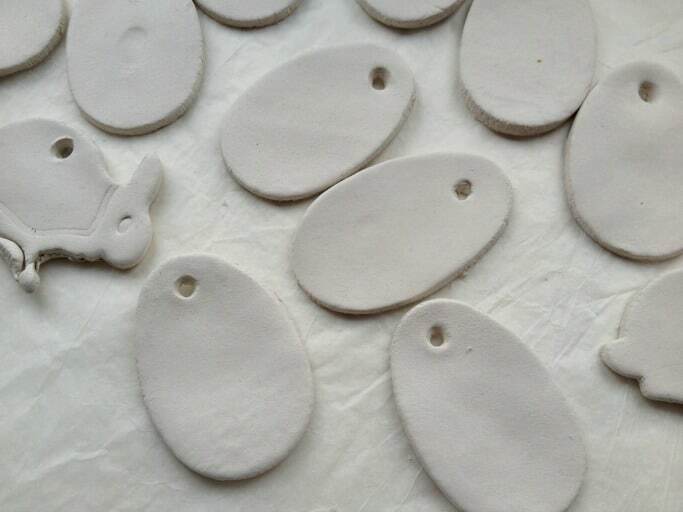 As my kids are aged 1 and 4 I find that they often want to do things straight away and waiting for clay to dry isn’t one of their favourite activities! This is also one of the reasons I use ready made clay rather than making salt dough but if your kids are ok with the wait then by all means do that instead. My four year old son helped my roll the clay out and then alternated between doing some drawing and making ‘delightful’ clay worms. He made me take a picture of them but I think I’ll just let you imagine that one 😉 I used egg and rabbit shaped cookie cutters and made a hole in each for the thread using a pencil. You may also find that you need to smooth the edges down with your fingers. 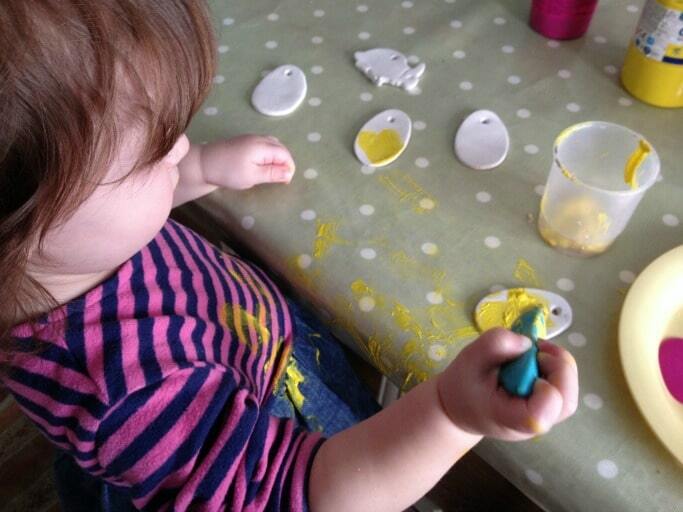 The clay eggs took a day to dry and then I set my kids free with the paints. My son told me what colours he wanted to use and I let my daughter point at the colours she liked. Feel free to judge me on the mess she made, the smallest adores painting but unfortunately for me she adores painting everything especially herself. Must buy an apron!! 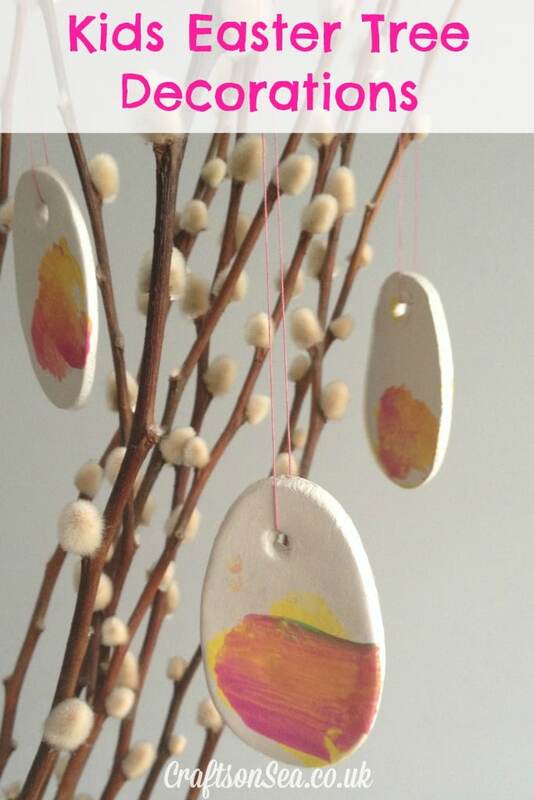 Once the kids were clean and the paint was dry our Easter tree decorations were ready and all they needed was threading through with a bit of cotton so they could be hung up. I’m using a few branches instead of a Easter tree as sadly I have nowhere to store one during the rest of the year but I still think it looks pretty cute!